Roscoe Medical, Inc. is a leading specialty distributor of respiratory supplies and replacement parts to the home medical equipment (“HME”) market. The Company’s products are sold to over 2,000 customers, which include national HME dealers, buying groups, independent HME dealers, and independent repair facilities. 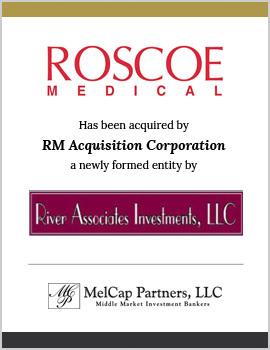 MelCap Partners acted as the sell side advisor for Roscoe Medical. Roscoe Medical was acquired by River Associates Investments, LLC, a private equity group.